Osteopaths can provide diagnosis, manual therapy, and advice on a wide variety of musculo-skeletal problems, sports injuries and pain. Osteopathy is not just about back pain. Osteopaths are able to help with a wide range of aches and pains. Back pain is the most common thing we see but we are trained to deal with such things as knee pain, hip pain, ankle problems and many other common conditions. Each patient is given a consultation at which time we can advise on your best course of action for a speedy resolution to your problem. To discuss your requirements please give us a call and we will be pleased to assist you. 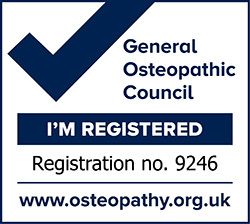 The Statutory Register of the General Osteopathic Council (G.Os.C.) opened on 9 May 1998. 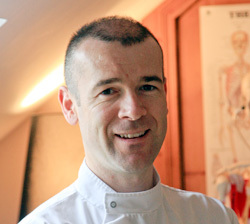 The title “osteopath” became protected by law from 9 May 2000. As a result it is a criminal offence, liable to prosecution, to describe oneself as an osteopath in Ireland and the UK unless registered with the G.Os.C. How do you become an Osteopath? Training courses generally lead to a bachelor’s degree in osteopathy (a BSc Hons, BOst or BOstMed) or a masters degree (MOst). Courses usually consist of four years of full-time training, five years part-time or a mixture of full or part-time. There are also courses with accelerated pathways for doctors and physiotherapists due to previous training. A degree course includes anatomy, physiology, pathology, pharmacology, nutrition and biomechanics, plus at least 1,200 hours of clinical training. Osteopaths use their hands to diagnose and treat a range of illnesses and painful conditions, osteopaths view abnormalities in the structure of the body and the way it functions can cause many common illnesses. Osteopaths use palpation (highly developed sense of touch) for examination to identify points of weakness and excessive strain. Osteopaths are expected to understand the pathology of disease, and they are also expected to recognise undiagnosed pathology and refer on if necessary. Physiotherapists are trained to evaluate, osteopaths to diagnose. Traditionally the osteopathic concept has been that any physiological changes in a disturbed spinal segment would affect the surrounding autonomic nerves and lead to an impaired blood supply to any tissues supplied from that level. As a result Osteopaths focus more on the motion of the spinal segments. In treatment terms this means Osteopaths prefer longer treatments with more work on muscles and, perhaps, a more gentle manipulation. Osteopaths typically use gentle manual techniques for improvement of mobility and range of movement, stretching to help joint mobility and massage to relax stiff muscles. Osteopaths undertake 4 – 5 years Degree pathway and 1,200 hours of ‘touch therapy’; they become expert in palpation and manipulation. Problems treated in particular by osteopaths involve muscles, ligaments, joints and nerves, such as in; back pain, sports injuries, repetitive strain injuries, arthritic pain and sometimes migraines. Osteopaths may give patients exercises to work on at home, as well as advice on diet and lifestyle changes. Osteopaths study for their degree for 4-5 years full-time, and there are opportunities to specialise with MScs or PhDs in particular areas like osteopathic sports care through the Osteopathic Sports Care Association. All osteopaths must be registered Osteopathic Council Of Ireland (OCI) or with the General Osteopathic Council (UK) before they can practice. Physio’s use a range of treatments; including manipulation of joints, therapeutic exercise, electrotherapy, ultrasound, and hydrotherapy to treat a variety of injuries or other health problems. Many problems treated involve; joints, ligaments, spine and muscles, however physiotherapists can also develop exercise programs to help in patient rehabilitation from surgery, accidents, or other. Physiotherapy focus very much on mobility and it is more closely aligned to traditional medical approaches; indeed many Physiotherapists operate within the Health service as well as private practice. Its focus on using electrical therapies such as short-wave diathermy, ultrasound and heat lamps is a key difference. In addition, Physiotherapists also have a particular focus on remedial exercises and increasingly offer facilities for supervised exercise as part of an effective rehabilitation program. Physiotherapists are qualified to a degree level, typically studying for 3-4 years. Their profession is statutorily regulated in Ireland and the UK. Osteopathy is a system of assessing, clinically diagnosing, treating and preventing a wide range of health problems. Osteopaths are commonly known for treating back pain and postural problems including changes due to pregnancy, caused by driving or work strain, the pain of arthritis and minor sports injuries. Low Back Pain; SIJ Pain; Hip pain; Knee pain; Foot & Ankle pain; Arthritis; Strains, Sprains & Sports Injuries. Patients have also found osteopathy helpful for conditions such as digestive issues, circulatory problems, neuralgia and problems sleeping and for the symptoms of many others. Osteopathic patients include the young, older people, manual workers, office professionals, pregnant women, children and sports people. If you want to find out more, any registered osteopath will be happy to talk to you about your health and how you may benefit from osteopathic treatment. The initial consultation, case history, examination, orthopaedic assessment, medical examination and treatment €75. Follow up treatments are €50. Your initial consultation may last up to one hour. This will enable your osteopath to take a thorough history, examine and depending upon your condition, treat you. Follow-up treatments are usually shorter depending on your condition it can take between 30-45 mins. Your osteopath will ask about your problem and symptoms. This will include your medical history, any medications you are taking or other factors that may not appear to be directly related to your problem. Your osteopath will advise you if they can treat you or you need to be referred. Your osteopath will conduct an examination and clinical tests. These include diagnostic, orthopaedic or neurological tests, postural assessments and activities or exercises, which will help determine how best to manage your condition. The examination may include passive and active movements. The osteopath may lift your arms or legs and you may be asked to bend over or stand in your underwear. Be sure to wear comfortable, flexible and appropriate underwear. A pair of loose shorts and a vest top may be worn if you wish. Your osteopath may then ask you to get on to the treatment table, so that further examination and tests, such as reflexes, sensation and examination of the painful area, can be done. When this is completed your osteopath will discuss the findings with you and give you an idea of what is wrong.Once a diagnosis has been made we will do our best to explain this to you. We have access to charts and models to make the explanation more understandable. We will then explain the treatment we would recommend and answer any questions you may have. Osteopathy takes a whole of body approach to treatment. Your osteopath may look at the area that is troubling you as well as other parts of your body. For example if you have a sore knee, your osteopath may also look at your ankle, pelvis and back. Your osteopath may also provide education and advice to help you manage your condition between treatments. This may include giving you exercises to do at home or work. Osteopathy focuses on the diagnosis, treatment, prevention and rehabilitation of musculoskeletal disorders, and the effects of these conditions on patients’ general health. We offer a comprehensive range of treatments to treat injuries, recurring pains and any problems you may be having with body mechanics. We can also advise on rehabilitation after an injury.